The Danish Days Festival is an annual event in Solvang, California, dating to 1936. 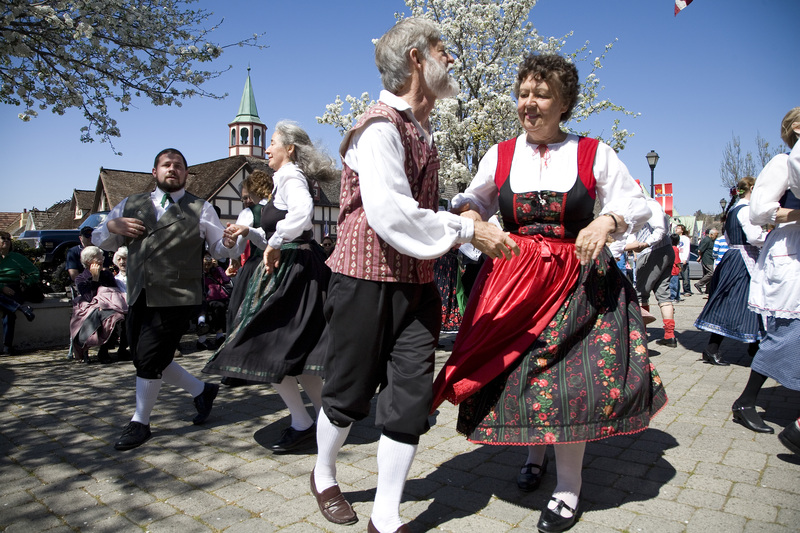 The event honors Solvang’s Danish heritage through traditional music, dancing, food, folk art, and storytelling. Solvang, California, (population 5,286) is nestled in the Santa Ynez Valley wine country on California’s central coast. The city’s name means “sunny fields” in Danish. Solvang dates to 1911, when a group of Danish Americans purchased 9,000 acres of the former Jonata Ranch. To preserve and promote Danish culture, the founders constructed Atterdag College in 1914 and the Bethania Lutheran Church in 1928. Danish royalty has visited three times, inspiring local organizations to keep strong ties to Denmark. Solvang incorporated as a city in 1985 and receives more than 2 million visitors annually. The city promotes itself as the “Danish Capital of America” because of its European-flavored culture, architecture, and museums. The Elverhoj Museum of History and Art exhibits the history and Danish culture of Solvang. The museum maintains a research library of Solvang’s history, including materials used for lessons for third and eleventh graders. The museum also presents changing art exhibits by local and international artists. The museum is supported by a group of volunteers through various activities, including educating visitors, collections documentation, and school curriculum support. As part of the research for a Solvang book project, the museum collected family histories on all 81 original Danish settlers. The Elverhoj Museum also hosts year-round Danish cultural classes for all ages. These classes include conversational Danish and Danish sandwich making. The Danish Days Festival is an annual event in Solvang, dating to 1936. The event honors Solvang’s Danish heritage through traditional music, dancing, food, folk art, and storytelling. The Taste of Solvang Food and Wine Festival features a walking Scandinavian-style smorgasbord, dessert reception, and wine-tasting event. The Julefest is the Solvang winter festival, running from mid-November through the end of December. Events include the tree lighting ceremony, a parade, and community caroling. The Solvang General Plan directs the Planning Commission to protect and preserve the community’s Danish American heritage while leading the evolution of the city. The Solvang Board of Architectural Review helps to maintain the Danish and Northern European architectural character of the downtown.